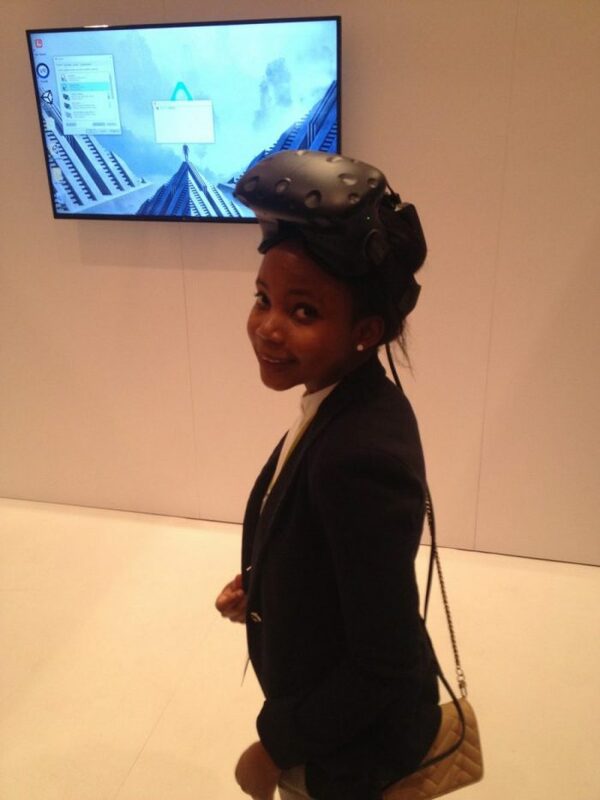 Way back in June 2016, MistyWest acquired a super-neat thing called the HTC Vive, which is somewhat old news now but was the coolest kid on the block virtual-reality-wise at the time and we thought that was pretty peachy. Many wows were had, and the Westies rejoiced as we battled in Space Pirate or painted virtual landscapes with Google Tiltbrush. Shortly after, the hype wore off, and a few of the Westies realized there is one issue that tied them down and forever hampered their virtually limitless experience: that snake, the tangler of ankles… the headset cable. One brave Westie had an idea; what if we could make the Vive even better, through the magic of robots? So with that goal in mind, our hero Justin Lam decoded how the Vive’s Lighthouse sensor pulses communicate with the headset position and used that information to write software to control some stepper motors. 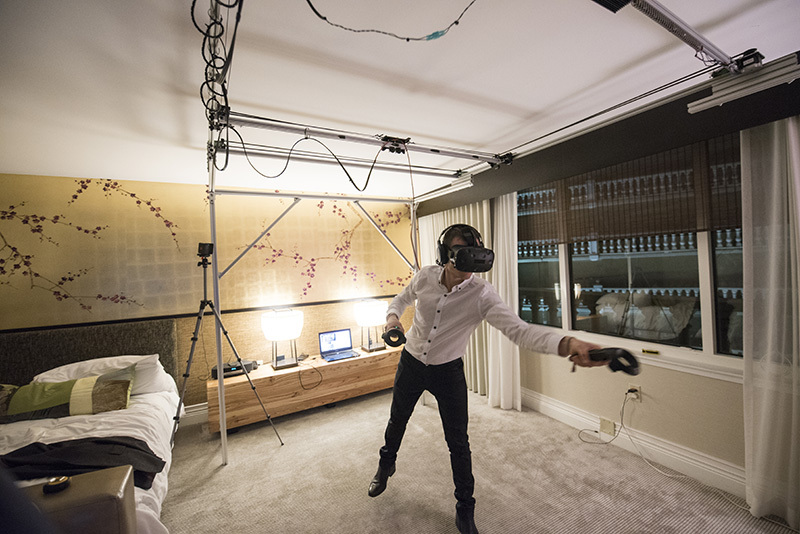 In about a month he had built a motorized gantry dubbed the “Robot VR Sherpa”; it was suspended from the ceiling in our downstairs lab and reliably followed behind whoever was using the Vive, ensuring the cord was tangle-free and out of mind. Fast forward to CES 2017: MistyWest co-hosted a party with the likes of Isobar, Vann Alexandra, TZOA, MIT Media Labs, and Trackr, where we demoed the VR Sherpa to guests. We received many a rave review for our invention and many questions about how this stands up to the release of wireless VR. The answer was obvious: Just look at it standing up, and holding those cables like a champ! And stand up it did- tall, and proud. However, also present at our party, in a room adjacent to where our beloved Sherpa was set up, was a TPCast demo. Now, if you haven’t heard already, TPCast is HTC’s new protege out of Shenzhen. It is the knife (cloaked in an HTC Vive addon) that is severing the head of the snake that is the cord between the VR headset and the gaming rig. Yeah yeah yeah, it is the immediate future of VR hardware, we know. Having our Goliathian gantry right next to the TPCast was a mind-blowing reality of its own. Trying one then another felt a lot like hopping in and out of the future. Our guests got to try both, a very exclusive offering given that the TPCast is not available for order yet and our gantry will never be for sale. (We might open-source the code though sometime soon, though). 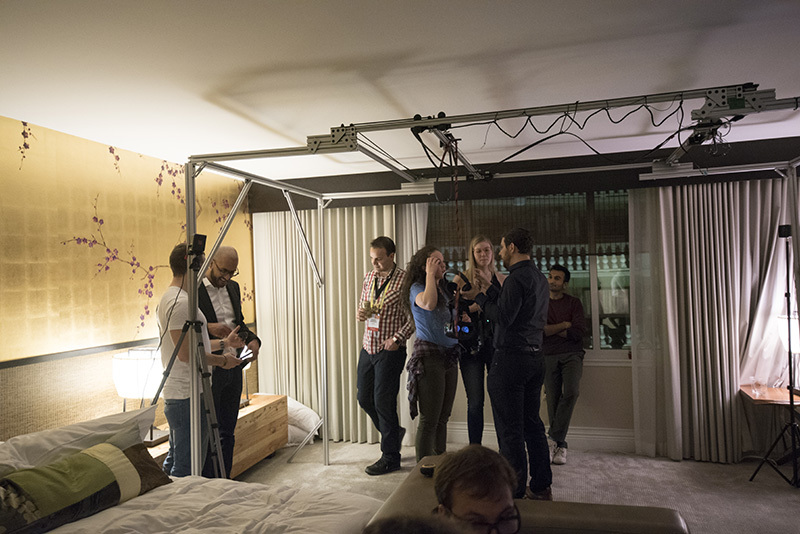 Anyway, the point is that our guests are the only group of people on the planet who could use: “What do you think – gantry or add-on?” as a party conversation starter and not get blank stares. Yes, admittedly, now that wireless VR is a reality the robotic gantry approach seems a touch overkill. But before you dismiss us for being a little extra, hear us out: We think (and we know A LOT about VR) for the foreseeable future, cables will provide the best data quality for any ultra high resolution VR systems. There is still a lot of room for improvement in that area, anyway. Key takeaway is that the VR Sherpa is a cool toy, a useful rig for high-resolution-VR-enthusiasts, and a fun exercise in reverse-engineering.